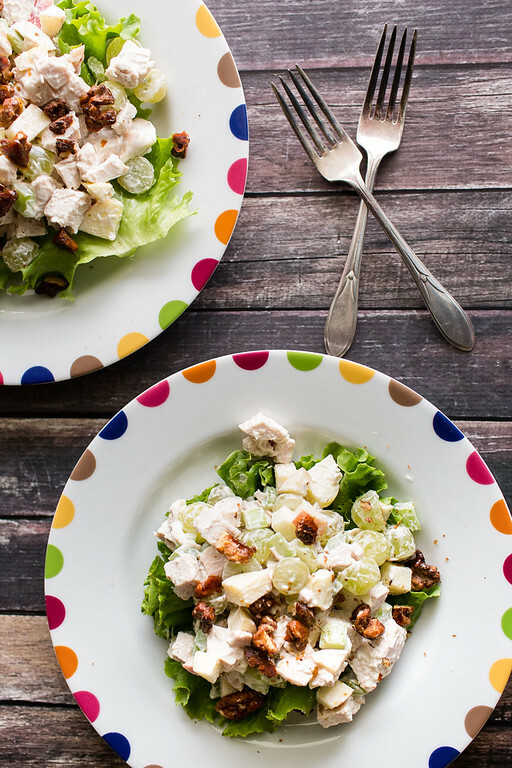 Turn a classic Waldorf salad into a delightful light lunch by adding cooked chicken. Chicken, grapes, apples, walnuts, celery, mayo, yogurt and lemon juice. A delicious year round salad. I know winter is all about soups, stews and braises. Comfort foods in a bowl or plate. Just because it’s winter doesn’t mean you need to stop eating salads. You just need to be little bit more clever, a little more resourceful. With global produce available year round, you can keep eating in the winter, the way you ate all summer long. But I find there is something fun and challenging about using produce with a little bit of fall or wintery slant to them. For a side dish winter salad, I love this Superfood Salad with Beets and Blood Oranges. It’s the perfect way to use blood oranges in their fleeting season – as is this Blood Orange Whiskey Sour. 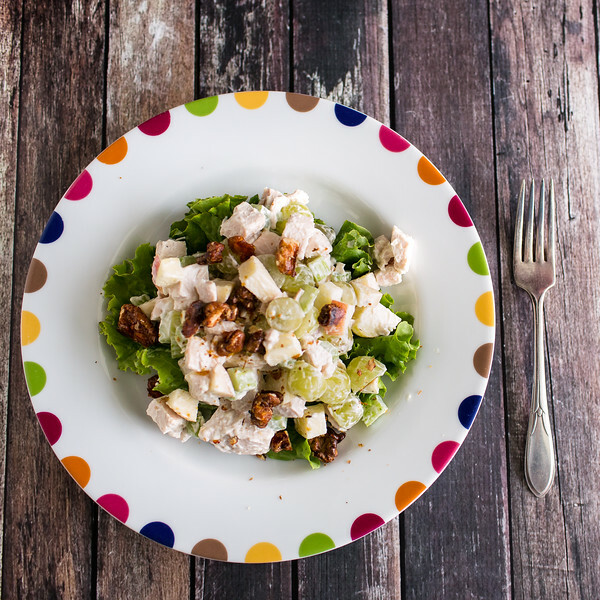 For a light lunch or dinner though, my favorite has become this Chicken Waldorf Salad. Chicken – shredded cooked breast. Can use rotisserie chicken or these Instant Pot Poached Chicken Breasts. Grapes – either red or green seedless. Walnuts – toasted or these candied walnuts would be wonderful! Apples – No need to peel. Mayonnaise – this avocado mayo is my new favorite! Plain Yogurt – whole milk or lowfat. Lemon Juice – fresh squeezed is best. Cut cooked chicken into bite sized pieces. Cut seedless grapes in half. Dice celery. Dice apples – no need to peel. Add all to a large bowl. Whisk together yogurt, mayo and lemon juice. Add to bowl and toss to combine. Add salt and pepper to taste. Place a lettuce leaf on a plate (optional, but adds a nice touch) and top with salad. Sprinkle walnuts on top. If you make this Chicken Waldorf Salad, be sure and let me know. I’d love to hear what you thought about it. With some rotisserie chicken this Chicken Waldorf Salad can be on the table in under 30 minutes! Place diced chicken, halved grapes, diced celery, and diced apple in a large bowl. In a dry skillet toast walnuts over medium-hight heat until fragrant. Remove from heat. In a small bowl combine mayo, yogurt and lemon juice and whisk to combine. Pour dressing over salad and toss to combine. Add salt and pepper to taste. Place a lettuce leaf on each plate (optional, but it looks nice.) Mound chicken salad on top. Sprinkle walnuts over. No need to peel the apples. Toast walnuts for extra flavor or use these Candied Walnuts. Can use all yogurt, all mayo or a combination of both. This was originally posted in 2015 and has been updated for 2019. This is one of my favourite easy salads to make. It is great for feeding a crowd too. I love a good budget friendly meal! Looks fantastic and a perfect lunch option! My dad used to make Waldorf Salad all the time! I had completely forgotten about it. Can’t wait to try it. This salad was PERFECT as is! Made it exactly as recipe stated and it was wonderful! Everyone just ate this! Very simple full of flavor! Will be making a lot!! I just would love to make this for our next brunch. It’s just perfect especially to add on top of tortilla or even garlic toast my family and friends will love this one! This salad looks so good, definitely have to add it to my lunch rotation this week! I love a super yummy salad and this one looks delicious!! This looks incredible! I love the idea of making this into a full meal type salad. $5.00 chickens would have me shopping on Friday also. Delicious and dressed just the way I like it. I have to admit to being a snob about rotisserie chickens but you have made them most attractive indeed. It looks like a terrific lunch! You can’t beat that price with a stick! Oh my gosh! You need to try it! Looks delicious. I wish I was having this for lunch today! That is an AWESOME deal! At least two days worth of meals and then some for $5. Can’t beat that! I know! Right! There is no way I can refuse it!